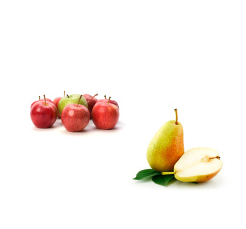 Better3fruit was founded in 2000 based on the apple breeding program of KULeuven. In 2005 Better3fruit also started breeding pear. Since then it has developed into one of the largest apple and pear breeders in the world. The breeding process is centred around the age-old principle of crossing and selection. By working on a large scale, combined with insights gained from state-of-the-art R&D, Better3fruit is able to develop a range of new unique fruit varieties, far superior in taste and quality. The work does not stop there. Through strategic partnerships a marketing concept is developed tailored to each variety. In the end, Better3fruits goal is to create added value for all partners throughout the chain: grower, nursery, wholesale. The launch of Nicoter/Kanzi® was Better3fruits first commercial exploit, which has developed into a worldwide success with over 7,5 million trees planted in 2017. The fast emerging Kizuri/Morgana® and a yet to be named apple will soon follow suit. Pcfruit is located in the heart of the fruit growing area of Belgium. Pcfruit covers applied scientific research, demonstration activities to fruit growers, co-development programs with various kinds of industries and services for fruit growers. All these activities are centralized at one central location with suitable infrastructure like labs, greenhouses, storage facilities, plastic tunnels, shelters, warehouses and orchards. Pcfruit consists of a cluster of research groups related to various disciplines like phytopathology, entomology, plant physiology (pomology), technology and environmental sciences. Besides crop specialists are organized according the following subsectors: pome fruit, stone fruit, strawberry and ligneous berry fruits and viticulture. Finally, a team of advisers are supporting individual growers in their fruit farm management activities. In pcfruit new and existing technologies, growing techniques and varieties are permanently evaluated and judged on their added value to fruit growing. Companies (from SME to multinational) are offered various services going from lab research to field evaluations. The individual fruit growers are assisted in the introduction of new technologies and sustainable production methods. A close relationship with individual growers and grower associations exists, which benefits transfer of research results or information.